In the first two pAsurams, maNavALa mAmunigaL described the greatness of SrI rAmAnuja. From this pAsuram onwards, he goes ahead and expresses what he yearns in his heart. Specifically in this pAsuram, he describes that SrI rAmAnuja is the all possible relation for him. Yet in order for that to fructify in its fullest state, the physical body that stands as an obstacle, has to drop out. maNavALa mAmunigaL asks why doesn’t this obstacle go away. ethirAsA – Oh yathirAja !!! ennO – what is the reason that? maNavALa mAmunigaL asks SrI rAmAnuja the reason why he does not bless him by taking away his physical body. Only if that happens, he can have a continual experience of a thought that he has now in this world. maNavALa mAmunigaL considers SrI rAmAnuja as his father, his mother, his wife, his children, his eternal wealth and much more. But this thought does not seem to be eternal while being in this earth and is temporal. This is the reason maNavALa mAmunigaL asks SrI rAmAnuja as to what prevents him in taking him to his fold so that he can have the thought without any interruption. 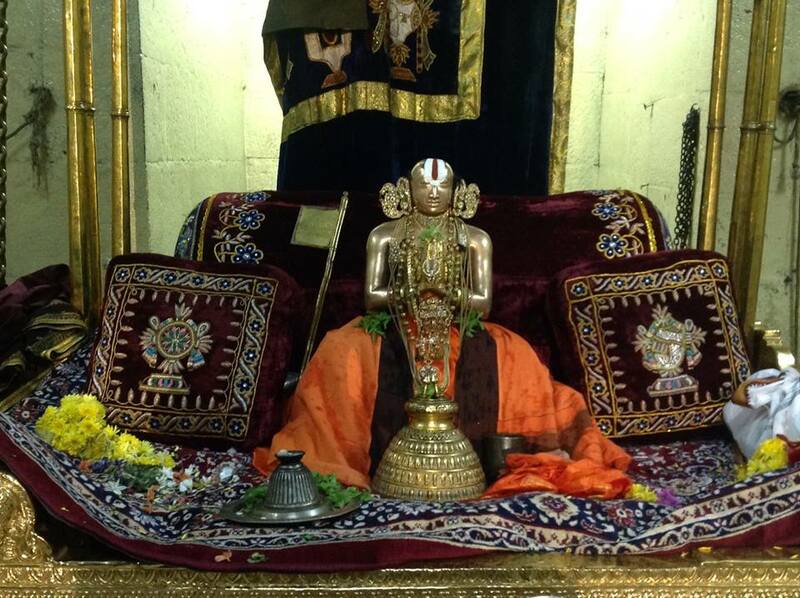 maNavALa mAmunigaL addresses SrI rAmAnuja as the one who is the leader of all yathis (yathirAja). “sElEy kaNNiyarum perunjelvamum nan makkalum mElAththAy thandhaiyum avarE iniyAvArE (thiruvAimozhi 5.1.8)” and “thvamEva mAthA cha (SaraNAgathi gadhyam)” are two quotes taken here. maNavALamAmunigaL asks SrI rAmAnuja that it was periya perumAL (at srirangam) whom SrI rAmAnuja treated as the father who gives only the good for a child, as a mother who gives the pure love to a child, as a wife who gives pleasures to her husband, as a good son with great virtues and finally as his treasure that give everything. As per AlavandhAr’s celebratory pAsuram towards nammAzhvAr “mAthA pithA yuvathaya: (sthOthra rathnam 5)”, he considered nammAzhvAr as his everything. Similarly, maNavALa mAmunigaL tells SrI rAmAnuja that the latter is everything for him (maNavALa mAmunigaL). This is the condition of maNavALa mAmunigaL currently. However, he realizes that his physical body poses the biggest threat for this condition to exist eternally. He asks a question to SrI rAmAnuja as to why the latter is not blessing him by taking away his physical body this day right away, the very day and the moment in which maNavALa mAmunigaL realized that body is an impediment. maNavALa mAmunigaL requests SrI rAmAnuja to answer the question. He further asks him if there is any aspect that is making him worry/hesitate in blessing him. In this pAsuram the adjective “naRRai” is to be broken as “nalla + thAy”. It means a good mother who is characterized by vAthsalyam (the quality by which a person treats a blemish as a blessing). This adjective “nalla” (good) stands as an adjective to all others mentioned in this pAsuram like father, wife, child and wealth. It does not just confine to just the mother. The rules of poetry allows to do so. This entry was posted in Arththi prabandham, Other and tagged aarthiprabandham, mamunigal, ramanuja on June 16, 2016 by santhanam rajagopalan.